For over a year, I waited impatiently to dive into this Bruichladdich Micro-Provenance aka MP5 trio! I came across the set in Singapore at The Single Cask. taking a good long whiff of their open bottles and was intrigued. I kept thinking about them… and on my next visit, I was delighted they still had a closed set remaining. So I packed it up and brought it back to Mumbai for our merry malters! I decided to do it in the same order Adam and Allan did on their YouTube broadcast… so we began with the ex-bourbon. While I knew what we were sampling, my fellow whisky explorers tried it blind. We loved it! It began as a pure tropical treat and evolved into creme brule, bubblegum… We really enjoyed this whisky And found it was a fabulous easy drinking dram. It had a lovely balance, very tasty, becoming even more enjoyable as it opened further with water and had a little more time sitting in the glass. Remarkably, there was very little peat – just a light leather curl of smoke enveloped in creamy sweet goodness. Equally no one came even close to predicting the alcohol strength – there was talk of 46% or 48% with no one imagining 56.9%! I challenged my tasting cohorts to give their best guesses on what cask(s) went into creating this dram. After the Cognac surprise, speculation ranged from rum to virgin oak to bourbon… with the last spot on! What more do we know? We loved this whisky and wished there was more! By the end of the evening there were just a few drops remaining… clearly a good sign. 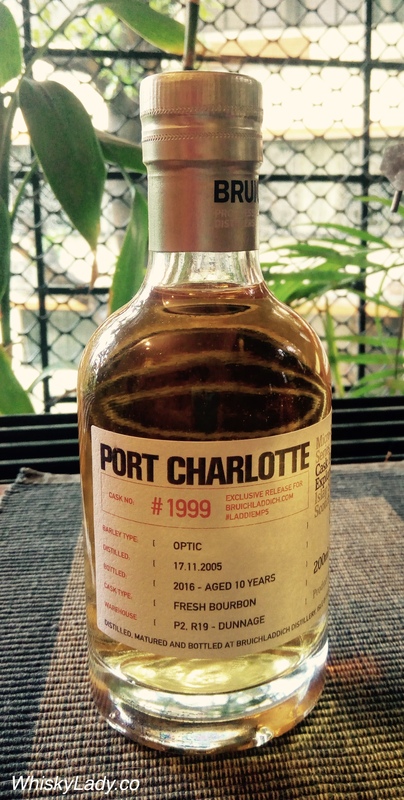 This entry was posted in Cask Strength, Islay, Scotland and tagged Bourbon, Bruichladdich, MP5, Peat, Port Charlotte by Carissa Hickling. Bookmark the permalink. Did you notice my question during the laddiemp5 from Adam Hannett?